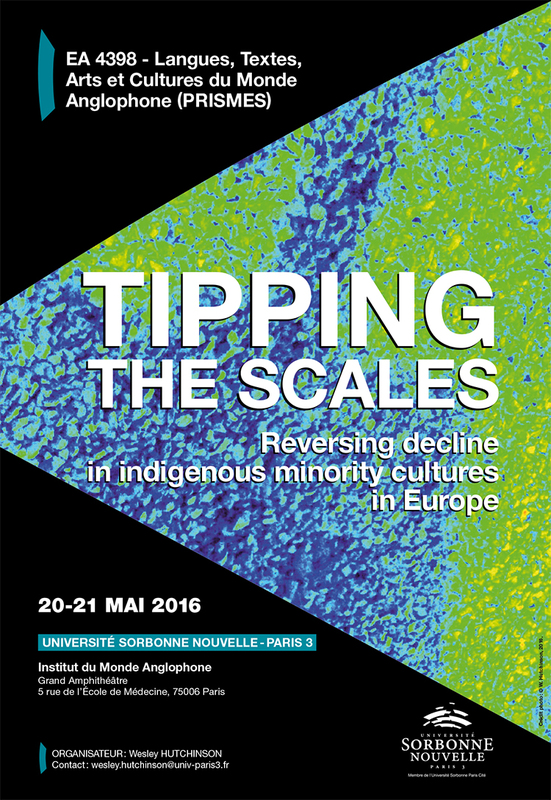 On 20th and 21st May 2016, Pôle Irlande (Prismes, EA 4398) will host an international conference entitled: “Tipping the scales: Reversing decline in indigenous minority cultures in Europe.” This conference forms part of our four-year research project centred on the concept of “neglect”. It follows on from a one-day symposium (1st October 2014) entitled: “Neglect: minority cultures”, which focused on the examples of Irish, Ulster-Scots and Breton. The conference seeks to develop this theme by looking at the factors that spark off the decision to intervene, in some cases after years of neglect, in order to defend what remains of a regional culture in the face of attrition under the influence of a neighbouring “dominant” culture so as to have it recognised as an integral part of the surrounding cultural landscape. Taking examples from different contexts in Europe, we will attempt to identify a typology of the circumstances that have to come together for such a revival to emerge and for there to be a reassessment of the traditions which hitherto had been the object of disdain and ostracism by the national intellectual élites, or even by the communities that are themselves the vectors of these cultural traditions. If all indigenous minority cultures in Europe have suffered discrimination from their respective state institutions, the situation is anything but uniform. Thus, Catalan language and culture have benefitted from ever-growing support from the institutions of the Generalitat, whereas Ulster-Scots or Gallo, for example, have entered the public arena much more recently, and find that their status is the object of on-going, sometimes acrimonious debate – even on the part of those who are themselves ardent defenders of other regional or minority languages. The conference will thus be particularly interested in looking at the problems faced specifically by languages which are close to major European – in some cases “world” - languages. Therefore, we will be looking at the revival of Ulster-Scots and Scots in a linguistic environment dominated by English, arguably the most powerful global language, while in France we will take the examples of Gallo and Poitevin-Saintongeais in relation to French, and Alsatian in relation to German. Or again, looking further afield, we will hear about Upper Silesia as a minority culture in Poland. This will allow us to place the debate in Ireland in a broader, comparative perspective and to identify the similarities and differences in the preoccupations and strategies of those who are defending the interests of these minority cultures on the ground. What determines the entry into the public space of an indigenous culture which has long been present within the territory of a State, but which has hitherto been content to accept its marginal status? What motivates the sudden desire for recognition? How much can been attributed to a desire to imitate other minority cultures within Europe? Can it be seen as a reaction to what is perceived as an increasingly standardised European cultural environment? Or is it first and foremost simply a question of grant-grabbing? What ingredients have to be present to market a minority culture successfully? How does the “emerging” culture go about taking its place within society? Which institutions should it target? What areas should it give priority to – education, publishing, the internet, cultural activities (traditional music, dance), sports activities? Which audience should it aim to reach – professional, popular, political? How should it negotiate its position vis-à-vis the collective past? Where should its priorities lie – in writing its own history, in writing its own literature, in constructing its own collective memory? Is there a required demographic? Does territorial concentration matter? How do these minority cultures negotiate their relationships with the surrounding “dominant” culture(s)? With other minority cultures? R. Lafont, Langue dominante, langues dominées, 1982. Generalitat de Catalunya, El catalán, lengua de España, n.d. The situation for Catalan in France is, of course, radically different. Ulster-Scots Agency, Corporate Plan 2014-2016, 2014, or Ministerial Advisory Group: Ulster-Scots Academy, Activities and Achievements: 2011-2015, 2015. Conseil Régional de Bretagne, Rapport d’actualisation dela politique linguistique pour la Bretagne, 2012.